Use the list below to learn about kits to improve your CRISPR/Cas9 workflow. Use the Guide-it sgRNA In Vitro Transcription Kit to produce high yields of single guide RNAs (sgRNAs) for Cas9/CRISPR studies. The kit includes the Guide-it IVT RNA Clean-Up Kit, a phenol-free kit used to purify sgRNA following in vitro transcription (IVT) reactions. The purified sgRNA is ready for use in transfection, electroporation, or in vitro cleavage assays. Guide-it sgRNA In Vitro Transcription Kit workflow. Avoid delivering ineffective single guide RNAs (sgRNAs) to your cells—use the Guide-it sgRNA Screening Kit to test the efficacy of sgRNAs. Guide-it sgRNA Screening Kit workflow. 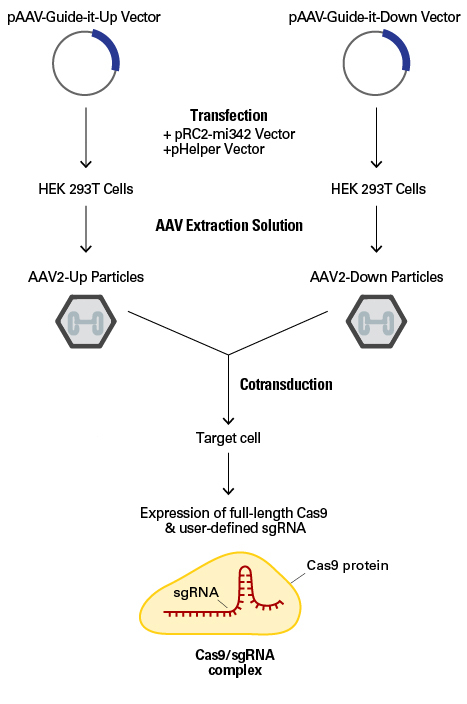 Use the AAVpro CRISPR/Cas9 Helper Free System to deliver expression cassettes for Cas9 and a target-specific sgRNA to hard-to-transfect cells. This system results in significantly higher levels of indel formation than what is typically obtained with plasmid-based delivery. 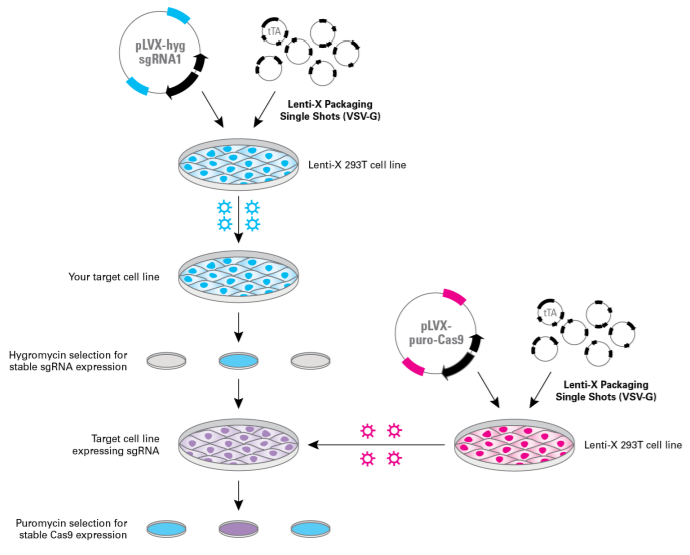 Our Lenti-X CRISPR/Cas9 System contains a Cas9 lentiviral plasmid and a separate pre-linearized sgRNA pladmis ready for insertion of your custom sgRNA sequences. We also provide our pre-lyophilized and ready to use Lenti-X Packaging Single Shots. The Lenti-X Tet-On 3G CRISPR/Cas9 System contains a third-generation tetracycline-inducible system for tight control over Cas9 expression with very low background. This kit has all the components necessary for producing dox-inducible Cas9-expressing cell lines along with a pre-linearized sgRNA lentiviral plasmid ready for insertion of your custom sgRNA sequence. The Guide-it CRISPR/Cas9 systems provide a simple method to generate a vector that will deliver a target-specific sgRNA, Cas9 nuclease, and a bright fluorescent marker to your target cells. 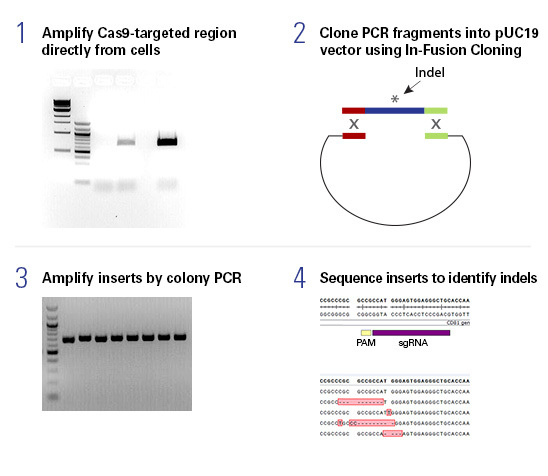 Use the Guide-it CRISPR/Cas9 Gesicle Production System to deliver Cas9 protein and a custom sgRNA to a broad range of cell types with very low cytotoxicity. Use the Xfect RNA Transfection Reagent to efficiently transfect mammalian cells with messenger RNA (mRNA) and/or single guide RNA (sgRNA) with very low cytotoxicity. 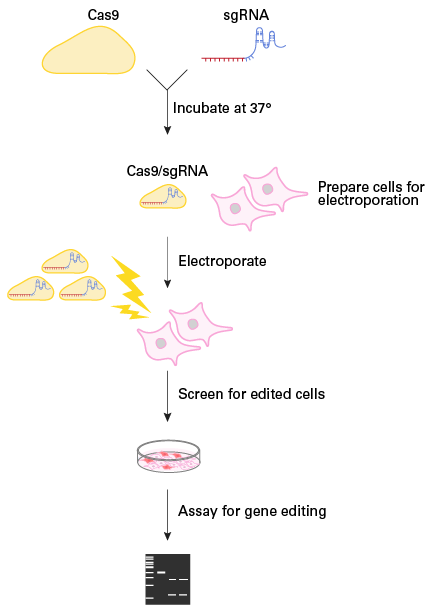 Electroporation of mammalian cells with Cas9-sgRNA ribonucleoprotein complexes allows you to minimize off-target effects while facilitating a fast turnaround for highly efficient gene-editing experiments. Try our Guide-it Recombinant Cas9 (Electroporation-Ready) for your CRISPR/Cas9-mediated gene editing experiments. Guide-it Recombinant Cas9 (Electroporation Ready) workflow. The Guide-it Mutation Detection Kit provides a simple PCR-based technique to identify insertions and/or deletions generated in mammalian cells using CRISPR/Cas9 technology. Guide-it Mutation Detection Kit workflow. The Guide-it Genotype Confirmation Kit provides a simple method to determine if a given clone has mutations in one allele (monoallelic), both alleles (biallelic), or is unchanged (wild type). Expedite the laborious process of screening a large number of clones for those with the desired genotype. The Guide-it Indel Identification Kit provides a complete workflow for identifying the variety of indels created by CRISPR/Cas9 gene editing in a cell population. One of the major challenges of knockin experiments is the production and delivery of the repair template along with the Cas9-sgRNA ribonucleoprotein complex. Although ssDNA repair templates have been shown to be more effective for gene editing than double-stranded DNA, their use is limited due to the difficulty of producing long templates or needing to use adeno-associated virus (AAV) for delivery. The Guide-it Long ssDNA Production System provides a fast and simple in vitro method for generating long ssDNA donor templates, which do not randomly integrate into the genome, are less toxic to cells, and do not require AAV production, resulting in a faster workflow and an improved gene editing efficiency. Guide-it Long ssDNA Production System workflow. One of the most powerful applications of genome editing is the introduction of nucleotide substitutions in specific genomic sites to mimic single-nucleotide polymorphisms (SNPs) related to human diseases or to generate stop codons that yield precise gene knockouts. However, screening hundreds of clones for a single edited nucleotide remains a challenge, especially in the absence of a corresponding phenotype. The Guide-it SNP Screening Kit allows the screening of hundreds of clones for single-nucleotide edits with a simple enzymatic assay. The fast and simple workflow comprises PCR amplification of the genomic target site followed by an enzymatic assay using a structure-specific endonuclease that generates a fluorescent readout. This method performs comparably regardless of the nucleotide substitution being assayed, the zygosity of the clone, or the sequence of the targeted locus. The Guide-it CRISPR Genome-Wide sgRNA Library System makes it easy to perform lentiviral-based, genome-wide phenotypic knockout screens using CRISPR/Cas9 in human cell lines. Included with the kit are expression systems for a genome-wide sgRNA library and Cas9 nuclease in our easy-to-use Lenti-X Single Shots format, enabling streamlined production of cell lines stably expressing both Cas9 and the sgRNA library. In addition to the library, we also offer a customized NGS analysis kit for our sgRNA library system so you can perform NGS analysis of your screens with ease. The Guide-it CRISPR Genome-Wide sgRNA Library NGS Analysis Kit includes the necessary primers, reagents, and accessories to prepare an NGS-ready library from screened cell populations.